Situated in an Area of Outstanding Natural Beauty, this enchanting Grade ll listed 16th century detached cottage nestling on Otford Green with views across to the famous listed Otford duck pond and the historic church of St.Bartholomews. Attractive elevations are part brick and part vertical tiled under a peg tiled roof, with a deep catslide roof to the side. An original barn, with later extensions that sits to the side of the cottage serves as additional living accommodation with a private garden, parking and private access. The current vendors have undertaken a programme of renovation to Bubblestone farm which has blended flawlessly with the original features of the period. In addition to the detached barn there are two further outbuildings, a pitched roof garage and large timber work shop. The gardens that surround the cottage are nothing less than a pure delight, a myriad of colour and rose arbours, hidden seating areas, paved walkways, and a 'secret' garden complete with the original wishing well. To the side of the cottage is a secluded shingled area for additional parking and access to the garage and workshop. The cottage accommodation is arranged over two floors with an abundance of exposed beams and latched doors. On the ground floor the light and comfortable sitting room boasts a magnificent inglenook, there is a separate dining room with a small inglenook which is open plan to a study area, a superbly fitted kitchen with an original leaded celestial window looking up to the first floor, a utility area, and a luxuriously fitted bathroom. 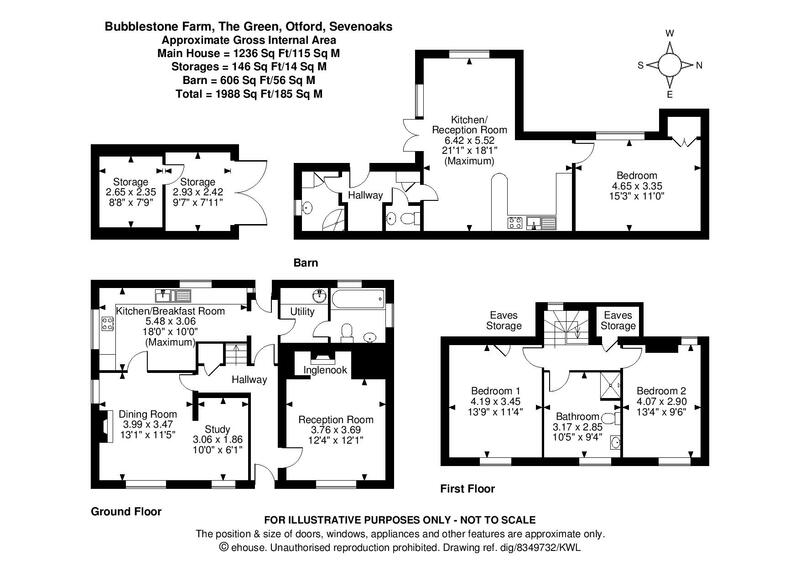 On the first floor there are two double bedrooms, one with a vaulted ceiling, and the third bedroom is currently used as a large shower room but could be reinstated as an additional bedroom. A note of interest, during the renovation of the cottage the vendors exposed what appears to be a simple sketch of a farm and the church. The drawing was discovered behind panelling above the kitchen door. The detached barn has private side access and garden area. Internally, there is a light and airy sitting room with a full wall of bifold doors which open onto the patio, an open plan kitchen/dining room, a shower room, and a spacious double bedroom. The barn has separate services to the cottage. Front Enclosing boundary wall with mature shrubbery and climbing plants. Recessed door to gardens. Sitting Room 12'4" (3.76m) x 12'1" (3.68m) (3.76 x 3.69). Solid wood latched door to hall. Exposed beams. Radiator. Casement windows to front. Carpet as fitted. Wall lights. Inglenook with bressummer beam, brick hearth, inset wood burning stove. Dining Room 13'1" (4m) x 11'5" (3.48m) (3.99 x 3.47). Solid wood latched door to hall. Exposed beam to walls and ceiling. .Double aspect windows to front. Window to side. Small inglenook with inset log burner. Carpet as fitted. Solid wood latched door to kitchen. Open plan to office/study. Study 10' (3.05m) x 6'1" (1.85m) (3.06 x 1.86). Window to side. Carpet as fitted. Meter cupboard. Kitchen Breakfast Room - Annexe 18' (5.49m) x 10' (3.05m) (5.48 x 3.06). Quarry tiled floor. Exposed beams to walls and ceiling. Exposed brick wall. Window to side. High level window to rear. Sloping ceiling with strip window beneath. .Bespoke ivory wood effect fitted base and soft drawer opening units with Corian work tops running above. Illuminated kick board and concealed lighting below worktops. White 'Neff' oven and Microwave in housing with storage below. Side by side, fridge and freezer in housing. Inset stainless steel sink with mixer taps above. Storage unit with pull out baskets. Latched wood door to hall. Bathroom Double aspect frosted windows to front and side. Panelled bath with centre water fall mixer taps and hand held micro shower. Full width vanity unit with inset wash hand basin and water fall mixer taps, soft close WC with concealed flush. Shaver socket. Radiator. Landing Beamed ceiling and walls. Window to side. Bi-directional landing. Deep cupboard housing hot water cylinder. Master Bedroom 13'9" (4.2m) x 11'4" (3.45m) (4.19 x 3.45). Solid wood latched door to landing. Window to front overlooking the green. Original leaded internal window overlooking the kitchen. Beamed ceiling and walls. Carpet as fitted. Linen cupboard. Radiator. Bedroom two 13'4" (4.06m) x 9'6" (2.9m) (4.07 x 2.90). Window to front overlooking the green. Window to rear. Beamed and vaulted ceiling. Bathroom 10'5" (3.18m) x 9'4" (2.84m) (3.17 x 2.85). Spacious. Exposed beams. Window to front. Gloss vanity unit in mint green with shaped inset wash hand basin and soft close WC with concealed flush. Heated ladder towel rail. Double shower cubicle with drench head shower and hand held shower. Garden Flagstone from rear door to paved patio. Courtesy lights by catslip roof. Shingled path to side seating area and log store. Raised flowerbeds, Steps to wood pergola with established climbing plants. Bi-directional paths. 'Secret' garden. High screening laurels and established trees and shrubbery lend an air of seclusion to this beautiful spot. Original wishing well, level lawns with shaded pathways. Wood pergola and security gate to extensive shingled parking area, pitched roof garage and timber workshop. Rose pergola with access to the detached barn. There is a private drive to the side of the cottage with twin five bar gates and extensive parking on the shingled drive. The gardens are stocked throughout with specimen shrubs and trees and well established flower borders, potted bay trees, fig plants, acers, wisteria and grape vines. Timber Workshop Spacious work shop with light and power. Detached Annexe Original brick built barn with further extensions. Pitched roof with ample loft storage. Mature wisteria and grape vine. Stable door to side. Shower Room Window to front. Pedestal wash hand basin. Corner shower cubicle. Linen cupboard housing central heating boiler. Part tiled walls. Kitchen Breakfast Room 21'1" (6.43m) x 18'1" (5.5m) (6.42 x 5.52). Comprehensive range of sun yellow wall base and drawer units with light wood work tops running above. Breakfast bar. Tiled floor. Space for fridge and oven. Single drainer stainless steel sink unit. Bedroom - annexe 15'3" (4.65m) x 11' (3.35m) (4.65 x 3.35). Window to side. Double bedroom with walk in wardrobe. Windows to side. Stained wood floor. Radiator. External Paved patio. Side lawn. Courtesy lights. Entrance gate from front boundary wall. Rear patio. Useful Information We recognise that buying a property is a big commitment and therefore recommend that you visit the local authority website www.sevenoaks.gov.uk, and the following websites for more helpful information about the property and the local area before proceeding. Countil Tax We are informed this property is in council tax band G you should verify this with Sevenoaks Borough Council on 01732 227000.